Do ever get days when you stand in front of your wardrobe drawing a total blank of what to wear and other days its like an epiphany when you throw a combintaion of things on and it really works! This outfit was one of those epiphany times...Ive never thought of throwing this crop jumper over this dress, so simple and yet it looks so great. It shows the peter pan collar off and adds warmth to give a different look than the typical cardigan. 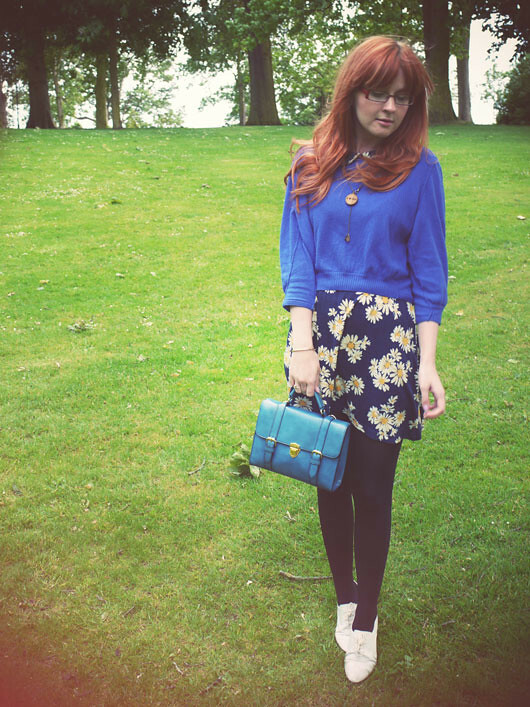 Cropped Jumper: Asos, Dress: c/o Matalan, Brogues: Topshop, Satchel: Asos, Necklace: c/o Stolen Thunder. The outfit definitely does work! 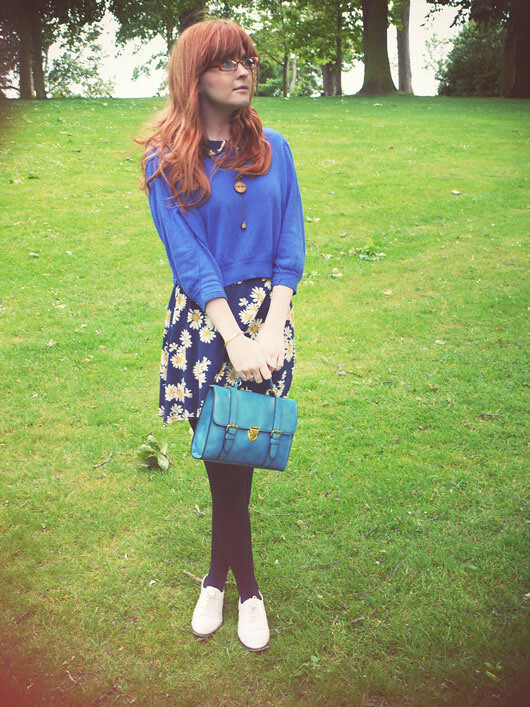 I love the dress, it looks great with the blue of the jumper. The white shoes are great with it, too. Too cute! Love the purse! Oh you look fantastic! I adore your jumper here! The whole outfit just looks cozy! I can't believe you just threw it together, just like that! that outfit looks sooo cool!!! wow! I love how the jumper really makes-over that dress! Lush! Dude, I literally talk about the weather all the time. Where other may find it small talk, I revel in it. You can't beat a gorgeous sunny day and I love the drama of a decent thunderstorm or downpour. Cracking. Lovely outfit there - I agree! Oh that dress is a much better length on you! Every day has been one of those stand in front of wardrobe days lately! That jumper looks perfect with your Matalan dress - an inspired combination! It's raining here, I wish we'd get some proper sunshine! Loving the different shades of blue!! 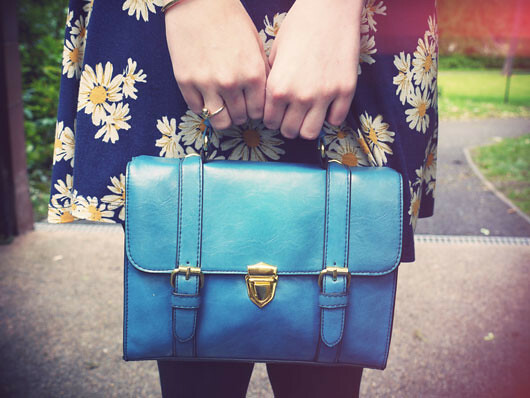 your bag & necklace are too cute! aww what a very cute necklace! I sooo wanted that dress when I saw it in Matalan. Love the necklace - so cute. This happened to me just yesterday! Very cute getup here! Super cute outfit, I'm totally loving the collar out look at the moment. Oooh I might try jumpers over dresses myself - this looks lovely. Also ideal layering for our confusing weather! Lovely! 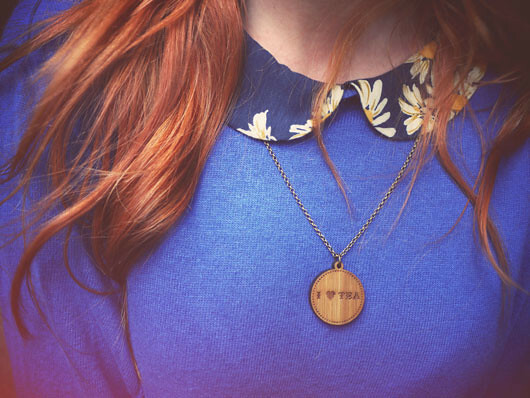 The peter pan collar is so cute, and I love the I <3 tea necklace! So lovely! I've been meaning to try the jumper-over-dress thing for a while, but it doesn't work with the clothes I currently have. Your version is great! This is such a fab outfit, I don't think there'a an outfit you have worn that I haven't loved! i do that so often vicki, ill think i have nothing and then this wave will come over me and i suddenly have a million things to wear haha! 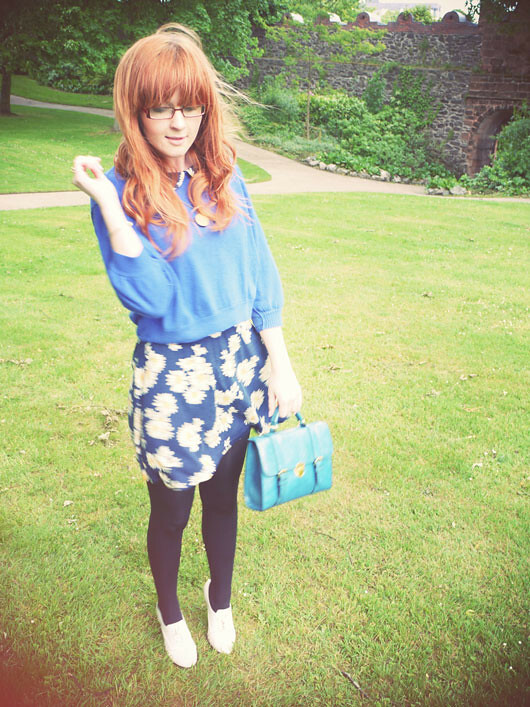 loving this combo, blue is lovely on you i adore the sunflower print. I so agree with what you wrote. I love your outfit so much, one of the most gorgeous I have seen in awhile. Beautiful dress, I have wanted a dress in that pattern for ages. I adore the jumper and bag. I really love how the peter pan collar jumps out against your blue sweater. Such a cute bag and awesome shoes too!